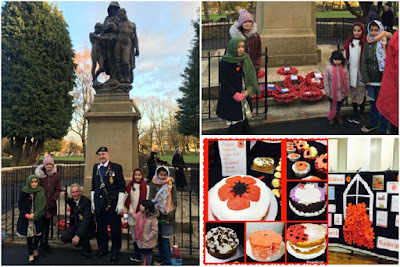 On 11th November 2017, they held a cake stall in order to raise money for the Royal British Legion. Youngsters also sold merchandise for this cause. A total of £212 was raised by the youth alone. For the past few weeks, the Bradford North branch of the Ahmadiyya Muslim Women’s Association (AMWA) have been raising awareness of the Poppy appeal. AMWA invited the British Royal Legion Bradford coordinator Barbara Allsop to give a talk to the community ladies. The AMWA created knitted poppies to fundraise for the cause and sold other merchandise. They raised £303. The youth of AMWA were also involved in raising money. They created an exhibition showcasing posters and shoe box scenes. On 12th November, several women and younger members of the AMWA attended a remembrance service in Allerton, Bradford.